by Lexi from Corinth, Miss. 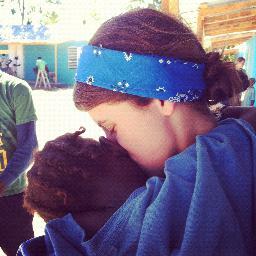 I have been to Haiti twice and I am absolutely in love with the people there. It brings me more joy than I can express to be able and be blessed myself, by helping the people. The first time I went, along with some of the kids from my youth group, we helped clear the area to finish a septic tank for the schools. And when I say clear an area, I mean move rocks equivalent to five dump truck loads. It was hard work, but I have never had so much fun working as I did moving those rocks. There were many times where I wanted to quit and didn’t understand how we were gonna be able to move this huge “mountain”. Then our youth pastor’s wife quoted Matthew 17:20- “I tell you the truth, if you have faith as small as a mustard seed, you can say to this mountain, ‘Move from here to there’ and it will move. Nothing will be impossible for you.” It says in that verse if you have faith in God, you can move mountains in His name. The Bible never said how he would move the mountain. And God chose to move that mountain by eight teenagers carrying rocks by hand, and broken wheelbarrows. At the end of the week we had the rocks moved, the area completely cleared and were ahead of schedule. In being faithful and trusting in God to finish the job, we were blessed by being able to go to the most beautiful beach I have ever seen in my life. God is always faithful, even when we have mountains and can’t see the other side.